Col's Creating Memories: First Post of 2013! Hello everyone and a Happy New Year, I hope 2013 will be a fantastic year for you! So my first post for 2013 is Whiff of Joy's latest challenge #145 - Celebrate, a great theme to kick start 2013, don't you think? 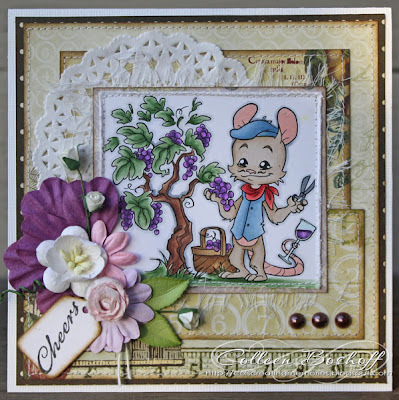 What a better way than to celebrate with a bit of yummy wine, this is 'Winegrower Henry'. 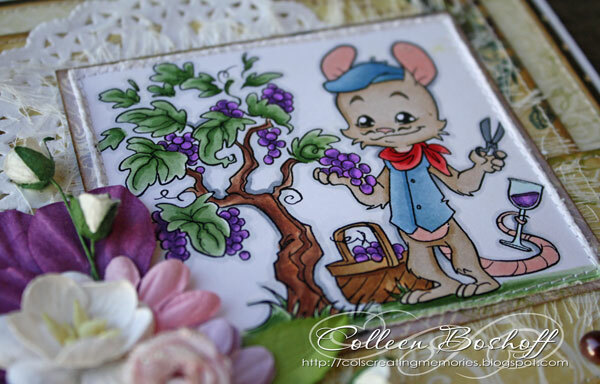 He was part of one of the 2012 Secret Stamp kits but is available as a digi if you missed this kit. I have used some Webster's papers that I have had in my stash for a while, the sentiment is also WOJ but I only used part of it, flowers are Kaisercraft and Wild Orchid, Flourish with a Bling pearls and the muslin, doily and tag are from my stash to. I generally don't use purples or lilacs but I thought it was a great touch to the wine and grapes. 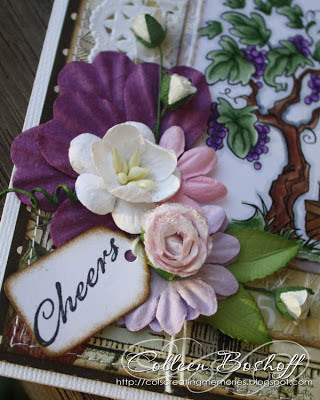 I hope you will join us for the first challenge of 2013 and thank you for stopping by and for your lovely comments. This is so great! I have this stamp but haven't had the courage to color it yet... I really like the tone in his tail and ears that you've used -would you mind sharing the copic numbers for those? Thats a very wonderfull card creation, looks very nice! Wat een beeldschone kaart, en die kleuren zijn ook zo mooi. Beautiful! I adore this image, wonderful coloring and your flowers are wonderful accents.